Television del Pacifico (TVP), a leading regional broadcaster in Sinaloa and Sonora States in Mexico, has installed and is operating a mobile studio to transmitter link (STL) to provide coverage of local events within an area of 50 Km radius. 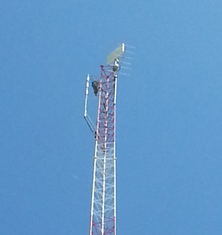 TVP installed a Cable AML microwave link (Salinas model) operating in the 13 GHz frequency band to provide point to point connectivity from a mobile van to a fixed tower site. The link was implemented with a 1.2 meter diameter tower mounted antenna on the receive and a 90 cm diameter antenna mounted on the mast of the mobile unit. The link enables simultaneous transport of DVB-ASI streams along with IP/Ethernet and data services. 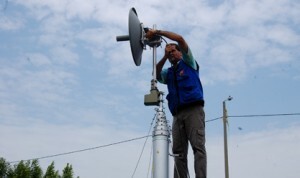 Uri Rubio, Television del Pacifico Technical Manager, supervised the installation of the link and commented that “the microwave link has been a complete success. It has been operating since the day it was installed with very good quality signal and excellent reliability”. Residents on the islands of Grand Turk, Salt Cay, Providenciales , North Caicos, Middle Caicos, South Caicos and East Caicos experienced an immediate and dramatic improvement in the quality of communications from government facilities after installation of a digital microwave backbone designed and manufactured by Cable AML. The system architecture consists of a number of links in series as opposed to a “star” or Point-To-Multi Point approach in which all delivery originates from a single, common point. The three principal links in series are between 40km and 50km each, with a total route distance in excess of 130km, mostly over water. The combination of 5 links in series and spectrum constraints made it necessary to use digital MPEG2 encoding of the video channels and QAM modulation of the ASI carriers. 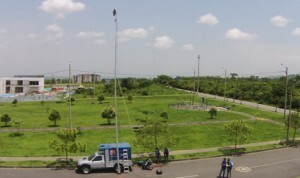 Multiservicios de Radiodifusion of Mexico City has installed a two-hop microwave link to transport one video signal at a distance of 20 kilometers. The links , which are installed in Mexico, are used to transport a video and two audios from a mobile unit to a relay point at a distance of up to 20 kilometers, from which a second link retransmits the signal to the studios 7 kilometers away. The link was configured using two TVLINKs in series. The mobile unit transmitter was mounted on a turntable platform which can be pointed in both azimuth and elevation to the Repeater. The repeater input antenna is also mounted on a rotatable platform which allows pointing of the antenna by remote control. The second link has fixed antennas at a height of 20 meters. Multiservicios designed, fabricated and installed the remote-controlled movable platforms, allowing the mobile station to relay signals at distances of up to 20 kilometers. A Point to point TVLINK was purchased and installed by Ultravision to interconnect the studio and transmitters in Aguascalientes, Mexico. According to Ingeniero Mario Tulio Santos, “The 15 Km link was extremely easy to install and align. We had it operating perfectly in less than 20 minutes”. Ultravision is a leading MMDS and television service provider in Mexico, with operations in several cities throughout the country. A new, transportable, TV Studio to Transmitter wireless system has been designed and deployed in Mexico to feed a MMDS transmitter with local news feeds from mobile cameras located within 5 miles (8 kilometers) of the MMDS transmitter system. The FM system, which operates in the 5.8 GHz band, an unlicensed band in the United States and many other countries, provides operators with a low-cost solution for local news gathering in small communities. The system consists of a portable transmitter with an integrated flat panel antenna and a receiver with an omni-directional receive antenna. This allows reception of signals from all points around the transmitter without re-orienting the receive antenna. The output of the receiver can be fed directly to the MMDS system. This enables low cost portable links for local news generation and transmission. The company Canal Villavicencio, located in the city of Villavicencio, Meta (Colombia), increased the news coverage of its “online” channel by putting into service a point-to-point low-cost TV Link, model TVLINK5.8-121. link covers a transmission distance up to 30 kilometers. The system operates in the “license-free” 5.8 GHz band and allows mobile coverage at low cost using portable equipment. This approach provides live connectivity from almost anywhere in the city and surrounding area to TV studio at the center of the city. A two-hop microwave link transporting one video channel for a total distance of 65 Kms has been installed in the Mexican resort town of Cancun to carry one TV channel from the Cancun TV station to Playa del Carmen, where it feeds a re-transmitting station broadcasting over the areas around Playa del Carmen and the island of Cozumel. The link was implemented by installing two TVLINKS in series. The transmitter was installed in Cancun at a height of 80 meters and it feeds a relay station in Puerto Morelos, where a receiver and a second transmitter are mounted on a 28 meter tower. 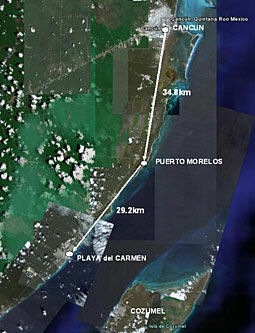 The second receiver is at Playa del Carmen at a height of 50 meters. 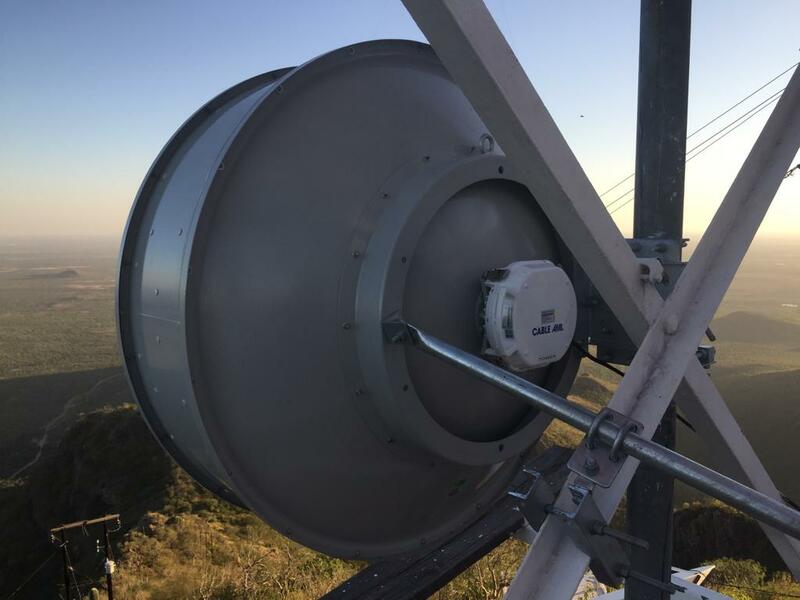 A low cost PTP link operating at 5.8 GHz has been installed in the state of Coahuila (Mexico) by Canal 5, to transport the local Channel 5 TV signal from Sabinas to a point 35 km away. According to Jorge Cesar, President of Canal 5, the link feeds a new TV transmitter covering the city of Muzquiz, also in the state of Coahuila. 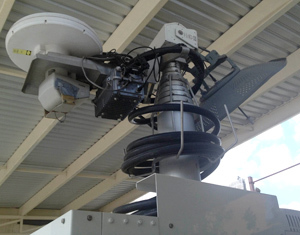 Cable AML has provided a cost effective state-of-the art system to transport video feeds from the US Virgin Island’s Legislature in St Croix to the nearby island of St. Thomas. The system’s first two hops are implemented with an 18 GHz FM modulated link carrying video and stereo audio from the USVI Government building in Fredricksted (St. Croix) to a relay repeater on St Georges Hill (1.75 miles) and then to a receiver at Blue Mountain (4.45 miles). To minimize cost and complexity, an on-frequency repeater at St Georges Hill was used to avoid de-modulation, re-modulation and signal processing associated with conventional video repeaters. At Blue Mountain the video and audio feeds are QPSK-modulated and frequency-multiplexed for transport by a 13 GHz bidirectional broadband link to the nearby island of St. Thomas (a distance of 44 miles). The receiver at St Thomas recovers the base band video and audio for transmission to the Government facility and the local cable system (Innovative Cable).